Omkareshvar located in Madhya Pradesh, 77 km South of Indore on the Mandhata hill on the banks of the Narmada is one of the 12 revered Jyotirlinga shrines of Shiva. It is located at a distance of about 12 miles from Mortakka in Madhya Pradesh. One source says that the Narmada river branches into two and forms an island in the center called Mandhata or Shivapuri. Another source says that two rivers come together (the Narmada and Kaveri). In either case the shape of the island resembles that of a Sanskrit Om. There are two temples here, one to Omkareshvar and one to Amareshvar. Legend has it that the Vindhya mountain prayed to Shiva - Omkareshvara and was blessed here. 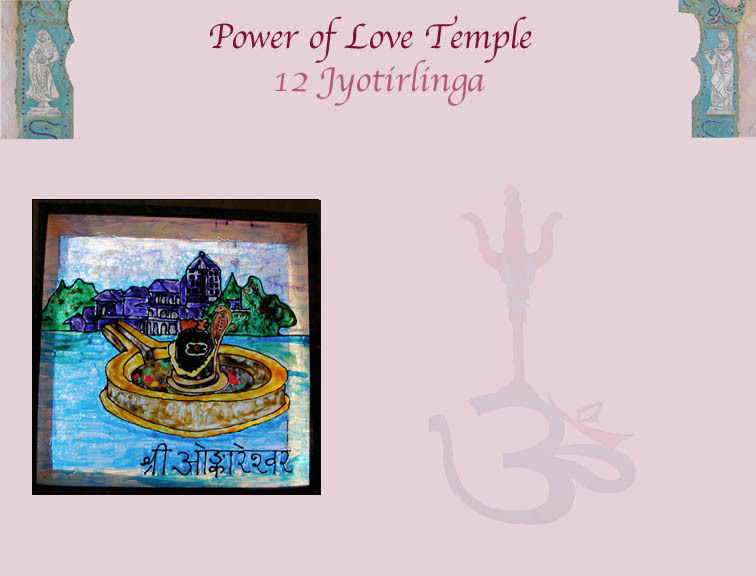 Legend also has it that upon the request of the Devas, the Shivalinga split into two, one half being Omkareshvara and the other Amaleshwara or Amareshwar. King Mandhatha of the Ishvaku clan is believed to have worshipped Shiva here. The Omkareshavar temple can be reached by ferry from the banks of the river. There are also shrines to Annapurna (Goddess of food) and Ganesha here.